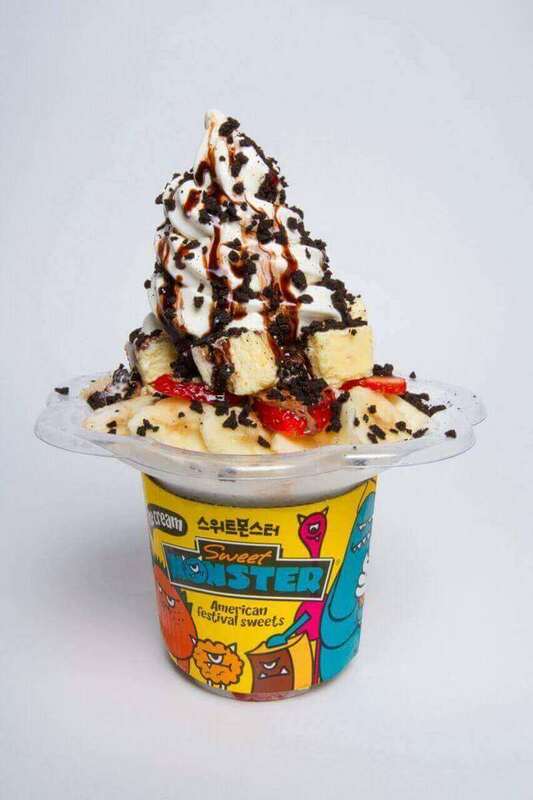 Sweet Monster is a vibrant, exciting and growing franchise that provides delicious desserts, and aspires to bring happiness to people. 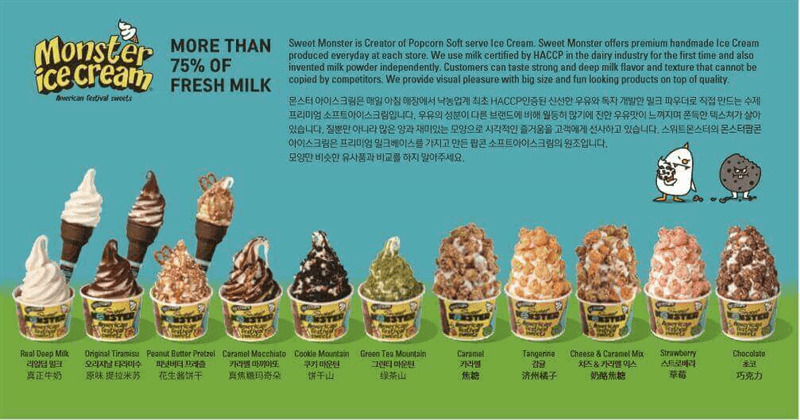 Sweet Monster is the Korean creator of popcorn ice cream and dessert franchise with 26 outlets in Korea and overseas outlets in China, Hong Kong, Taiwan, Thailand and Indonesia. 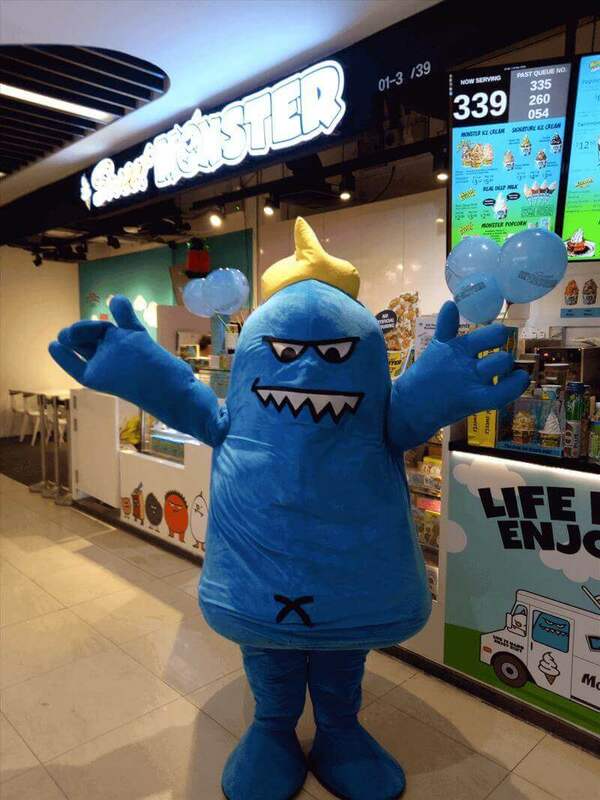 Sweet Monster is currently seeking franchisees for new opportunities in Singapore. Sweet Monster Korea was established in 2014 and drew attention from the market immediately with the originality and visual appeal of its products. 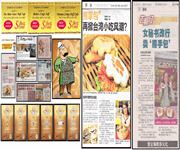 The brand's launch spread quickly on the internet due to positive word-of-mouth feedback. Sweet Monster's mission is to inspire people to live happy lives and create good memories with the Sweet Monster products. Sweet Monster's identity is visually entertaining, bold, dynamic and full of character. Sweet Monster has a strong branding that attracts customers of all ages. Sweet Monster is a concept that draws from the American carnival festivals. 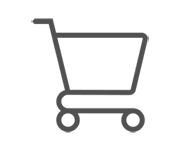 Sources of revenue and multiple streams of income are available from food products and merchandise, both at site, online and at events. 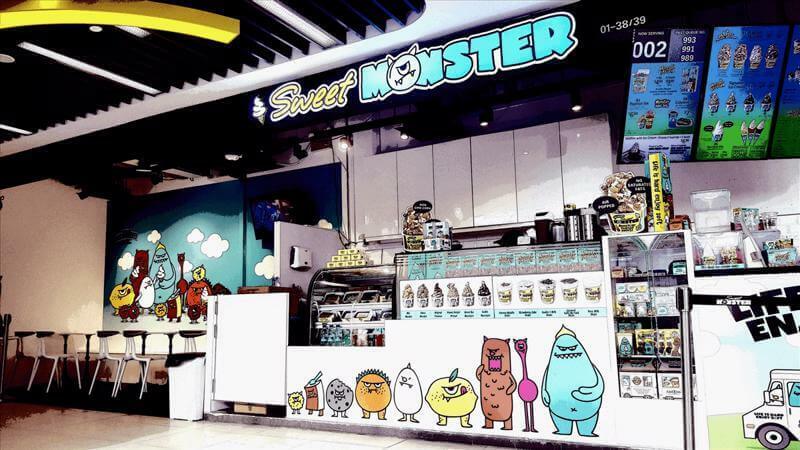 Sweet Monster is growing in popularity in Korea, and is easy to set up with low capital requirement , attracting entrepreneurs to come on board this exciting franchise. Franchisees do not need to have prior experience of F&B knowledge. The franchisee will receive consultancy and marketing guidance and training on store opening procedures, food products, back office administration, equipment operation and store management. Sweet Monster revolves around the central theme of the adorable Sweet Monsters. Each Sweet Monster character represents a part of the menu. For example, BlueMon represents the popcorn ice cream, CookieMon represents the cookie bits in Cookie Mountain and PopMon represents the signature popcorn! 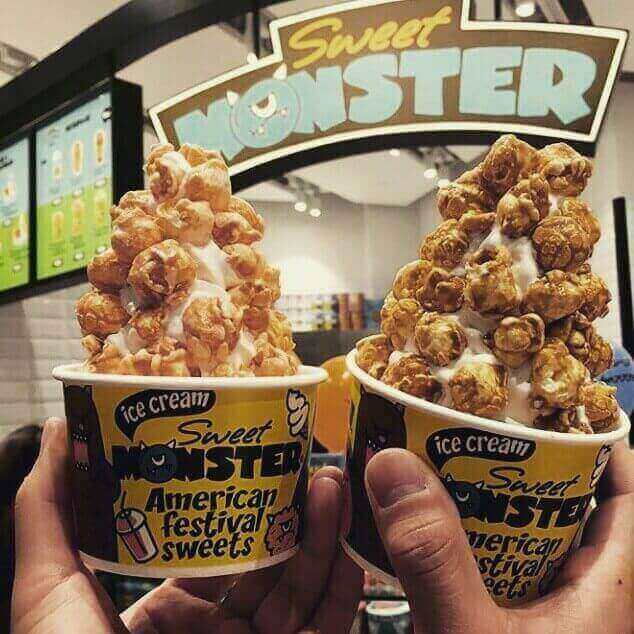 Sweet Monster defines itself as a company that sells not only desserts, but also happiness and positivity to our customers, since we believe that our success will come from our customer satisfaction. With this goal, Sweet Monster has tried to develop menus of a high quality, with visuals that can be loved by all age groups. Moreover, we also focus on the design of the package and interior so that it satisfies our customers' expectations. Our signature is our Monster Popcorn soft serve ice cream. The ice cream powder has less than 10% sugar, which is lower than most powder on the market. It has a six times lower milk fat content compared to traditional ice cream. It tastes creamier, smoother and lighter. The ice cream has 75% milk content and is halal certified. So it is high in calcium and other important vitamins and minerals especialy good for growing children. The ice cream power and popcorn are directly imported from Korea. The popcorn is stripped, does not contain GMOs and is an excellent source of dietary fibre. Our ADE drinks are a completely guilt free way to enjoy a refreshing drink. With zesty real fruit puree and bubbly sugar free, 0 calorie soda, you can have your drink and be healthy. 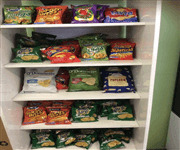 This is in line with government push to reduce sugar intake and to fight diabetes. Life is Hard, Enjoy Soft. 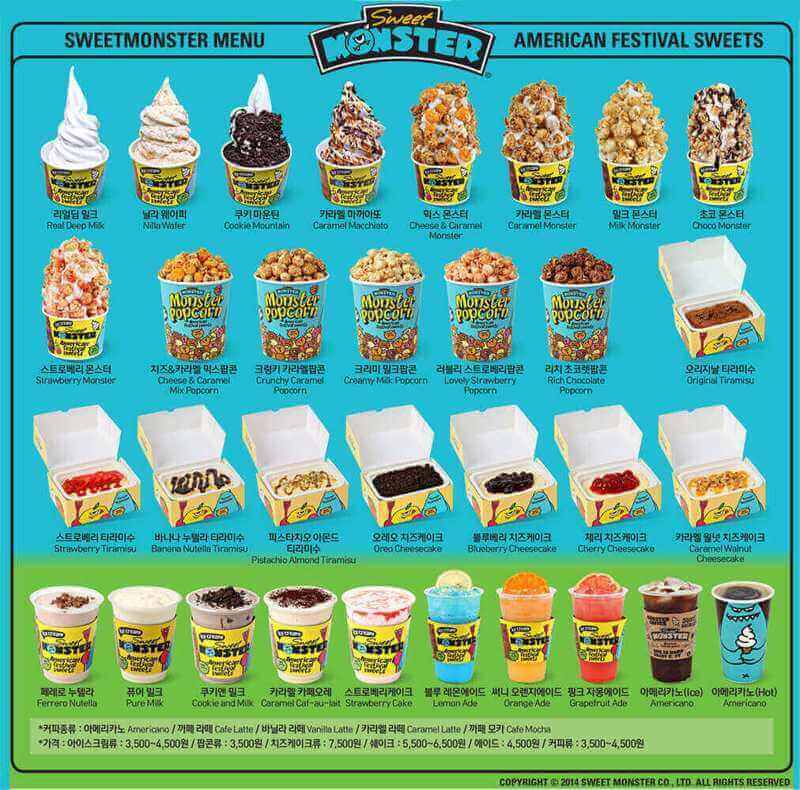 Join us as a Sweet Monster franchise today !